I started with Sally Hansen Great White as my base for a little shimmer, and from index finger to pinky, used a bunch of different colors for dotted leaves: Broadway Bora Bora, Jimmi's Purple, Powder Green, Picnic Day, and Snow Queen, Sally Hansen Blue Me Away! and Rapid Red. I don't drink coffee and 99% of the time opt for a thermal cup over a mug on the rare occasion that I drink warm tea. 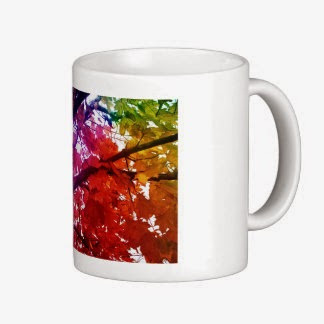 So I Googled and found this pretty rainbow tree mug, and used that as my inspiration for today's look. I copied my coloring from another rainbow tree image, but now I can't find it again to link it. Don't forget to check out the other fun TT manicures for today!